Lots of beautiful vibrant colors!!! 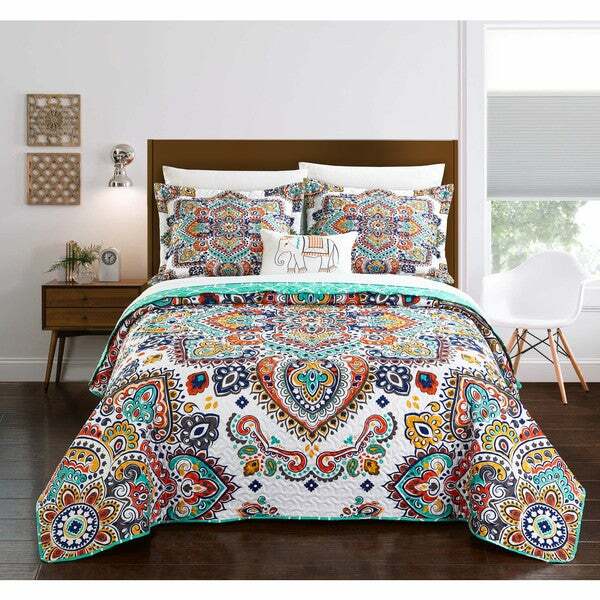 A globally inspired bohemian bedding collection with everything you need for that perfect chic Boho look. 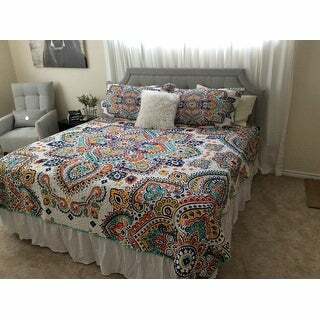 Bright and fun colors in aqua, tangerine and blue tones make this large-scale paisley and geometric pattern set the perfect choice for your bedroom decor. Super-soft microfiber sheets, design coordinated reversible shams and a trendy 'Elephant' deco pillow are included to complete the look. Good as a 3 piece quilt set. I use twin size and the quilt, sham and decorative pillow are very pretty. The sheet set is very thin and disappointing. I can't be bothered with the sheets (white). Buy this for the quilt set but use nicer sheets. It's a little more light weight than I wanted. But it is beautiful! This is bright and pretty and coordinates well. I am using it in a guest room and love how the quilt is reversible and coordinates with the throw pillow. The quilt is a little stiff but I assume it will soften with washing (which I have yet to do). Bright colors, soft sheets and beautiful pillow. Love this set! This set is beautiful, and I’m beyond excited to put these on my bed. I bought new sheets for this, so I can’t attest to the quality of the sheets provided, but the quilt is gorgeous and th colors and perfectly vibrant! Beautiful colors - bright! Perfect for that Boho look I was achieving. The spread is not thick, but I did not want a thick bedspread. Color was what I wanted and it was perfect. Thought the sheets were fine, Loved the elephant pillow - was not disappointed in anything! The picture doesn’t show how lovely this set really is. The colors are absolutely vibrant. I paired it with teal blue sheets and it literally lights up the room. If I were to change anything about it I would have less white and even more color. This is a great quality quilt. I love all the colors in this bright and pretty quilt - looks really nice in with the blue walls and yellow rug in the bedroom where it will be used. The colors are true to the online photos, and the quality is as expected. I am pleased with this purchase. Love the colors. The bedspread is light weight but keeps us warm. The white sheets are super soft and wash well. I'm sewing accent pillows and repainting an accent wall. Love it! The quilt had beautiful colors! The weight was a little lighter than expected, but overall very nice! The pillow was also fun and just the right size fir travel. Just a lovely set - for the money, especially. The color on website was way off from what it looked like in person. I absolutely hate it! I love this bed set! We painted our room a blue that was a little too much and this set was a perfect solution to the room! We are very happy with it !! and it was great for the price! Not as pretty as the picture. The colors are very loud. I had to return this item because it had loose stitching. Just as described. Colors are very vibrant and beautiful. I have it in my master and have gotten many compliments from friends. Love the bright colors. Delivered right on time. Sure brightens the bedroom up. "Can I get this set without the sheets?" This is only sold with the sheets. The colors match my teal accessories and the colors are crisp. "i am not seeing 8 pieces as described.. could you list the 8 items please?" One (1) Reversable Quilt, Two (2) Shams, One (1) Dec Pillow, One (1) Flat Sheet, One (1) Fitted Sheet, Two (2) Pillow Cases Twin has only 1 sham. "what color are the sheets."